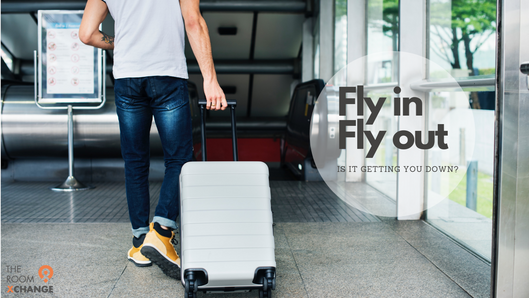 FIFO, otherwise known as Fly In Fly Out, is a common occurrence among certain types of industries. It requires the worker to fly to their place of work and live there for an extended period of time at regular intervals throughout the work year. The workforce is predominantly made up of people aged 35-54 years old; with 86% in a relationship and approximately 65% have children, with 20% of the sector is made up of females. The FIFO industry ranges far and wide, mainly in areas working with minerals such as gold or iron ore. However, FIFO workers also include politicians, health care workers, local government workers et al. Research shows partners of FIFO workers have an increased risk of emotional issues and strain on their relationships. The loneliness felt by the person left behind can be overwhelming and add additional strain on the relationship. If there are children involved, the stress associated can negatively impact on their behaviour and emotional well-being as well. Not to mention the additional pressure on the parent left behind to take over all the family responsibilities and quite likely juggling work at the same time. The FIFO worker could also be a single person who then has to leave their property unattended for long periods of time. If they have pets or a garden, they will need to hire someone to maintain and care for them while they’re away. FIFO can be highly disruptive to the workers overall life. Workers commonly stay in the FIFO industry for 5+ years, with 73% of the workers having partners also in the workforce. But what if there was a way that FIFO workers could minimise the stress associated with their absence? The Room Xchange offers an option. We can help you find an ideal guest, who can Xchange an agreed amount of time for food and accommodation. An Xchanger can look after the house while you’re away, provide company for the partner at home and/or help out with the kids. The list is endless. But more importantly, having an additional person in the home can help lift the burden enormously and greatly enhance stability for FIFO households and families. This could be a solution to provide some stability within the household and have someone to fall back on when times get tough for the parent or partner left behind.